A key downtown railroad crossing — closed for more than 15 years — could finally be reopened following a ruling by the California Public Utilities Commission. Assemblymember Todd Gloria, who represents the downtown area, said the commission late Friday granted a request by the City of San Diego to modify the Park Boulevard and Harbor Drive railroad crossing and open it to vehicular traffic. 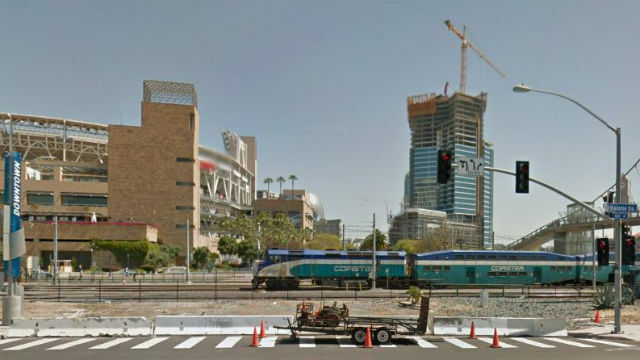 Barriers were erected in 2001 when Eighth Avenue was reconfigured to accommodate the diagonal extension from 12th Avenue, which was renamed Park Boulevard, as part of the construction of Petco Park. At the time, both the commission and BNSF Railway raised safety concerns. “For more than a decade, as long as I have represented downtown on the City Council and now in the Assembly, I have pushed for this project’s completion. Opening this crossing has the ability to make a world of difference to improve traffic flow in downtown, improve pedestrian safety, and connect vehicular traffic from Balboa Park directly to the harbor,” said Gloria. “I applaud the Public Utilities Commission for approving this modification, and I am grateful to the City of San Diego for their continued advocacy to bring this project to fruition,” he added. Gloria and Sen. Toni Atkins, along with every member of the San Diego legislative delegation, signed a letter to the commission in April 2017 urging the approval of the at-grade crossing. Reopening the crossing will require over $10 million in construction, and it was not immediately clear how long that would take.